Taking care of others seems to come naturally to some people and not so much for others. My daughter, for example, at the age of 8, is a natural caregiver. She has had that nurturing spirit since birth. For me, I am usually pretty good, but have my moments where I am just too self-absorbed or not thoughtful enough. I know some people, good people–I’m not trying to put them down in any way–that are awful at taking care of others. Caregiving is just not an area you would want them to be working. However, when it comes to close family members, everyone should be capable of some aspects of care-giving, because life happens. We all need to be ready to chip in when needed. Be it strangers, family members or pets, taking care of others is an important part of humanity. The act of care-giving strengthens the bonds between people and teaches little ones the importance of being thoughtful. My children’s lives have been enriched with value, compassion and loyalty after helping take care of sick family members. This year especially has been a real test for me. My grandma had a small stroke a few weeks ago and that turned my world up-side-down. Gram is like a mom, sister and best friend to me. That woman means more than anything! As soon as I got the call, I dropped everything and got to her as soon as possible. With two kids, extra curriculars, my own full time school load, work and everyday housework, this extra running around put a lot of stress on everyone. Just worrying about her health is enough but our hectic schedules don’t allow for much time for daily trips to the hospital. My workload only increased as my energy and stamina decreased from all the stress. I am still catching up after 2 months! I know many are not so fortunate and require full time care with no recovery in sight. The strength this requires is immeasurable for patient and caregiver. I give true thanks and admiration to the heroes that do this daily and typically go unnoticed. According to data from the National Alliance for Caregiving, an estimated 65 million people in the U.S. are unpaid family caregivers. Seven in 10 of those caregivers take care of someone 50 years of age or older, according to research done in conjunction with the AARP. Especially with aging baby boomers, many of our plans for traveling or relaxing in early retirement are replaced with being on-call 24/7 caregivers to our parents. Do not look at care-giving as a burden or inconvenience. Be a good, sincere listener. Don’t forget to reassure yourself. It’s okay to pat yourself on the back. You deserve it. Oh Shelley, I am so happy to hear that your Gram is making a great recovery with so much progress. She is luck to have such great support, no matter how difficult it is for you to re-arrange your schedule.. you always get there no matter what. That.. makes you a wonderful caregiver in my eyes! Thanks for sharing all of this info bringing to light all of the caregivers that selflessly give themselves everyday! I’m sorry to hear your grandma had a stroke but so glad to hear she is doing much better and you are able to help when you can. These are great tips and helpful for anyone in a caregiving situation. Sorry to hear about your grandmother. I hope that she keeps getting better. In your list of tips, I think that the tip to ask others for help is important. Too many people that I know do not ask for help and it bums me out later when I found out that I could have pitched in. these are some great tips, this will be useful to us soon. I was one of those “unpaid caregivers” for several years and remember being grumbly a few times with “ugh, what NOW”… its been 5 years since my grandpa passed and I would give anything for one more day to take care of him. I still miss him every day. I’m so glad that your gram is doing better after her stroke. Caregiving is the toughest thing on everybody. I am glad your gram is doing better! I am one of the unpaid caregivers for my dad and I have to admit, sometimes I grumble about it. I’m so glad she’s doing better! My uncle had a stroke a few years ago & was in the hospital for months so she’s one tough lady! I can only imagine how exhausting and consuming being a caregiver is. I like your tips and reassurance that the caregivers themselves need to cut themselves some slack. So true! Many times we focus on “me ” and forgot to think about what the other person is going through. Thank God she is doing better. i had to take care of my grandmother when she became sick and could not live on her own. I was the only family so I had to deal with everything alone. I can understand your post, It sometimes seems as if ,your list of things you should do, is almost unattainable. However you should stick with it because in the end ,when they are gone, you will miss them terribly and wish they were still there for you to take care of. i was my mother’s caregiver for over 12 yrs. i had to move back to town from another state, buy and sell a house, take early retirement, etc. my 3 older siblings were abusing her, not physically but mentally and financially- went thru most of her money, taken her valuables, took her home…she was nothing but a maid to my older brother. they sued her. along w/ me over times, trying to get her declared imcompetent and try to acuse me of abuse and taking her money, of course, i was found not guilty….and she always passed the compentency tests. the finaly straw which caused her dealth, my older brother went to see her against court orders, started his crap again, upset set her so much she fell and broke her pelvic bone, which she never recovered and died on the die i was defending her against her oldest son who was trying once again to sue her….even after her dealth, they still sued me, the last thing my mother said to me, while in the hospital, ( she had to have security guards and my brother sliced my tires) was the she finally realized that i was the only one who truly loved her and thanked me for all that i had done for her…i handled everything for her from healthcare, bathing, wiping, shopping, dr, bills, dressing, putting her to bed, cooking, legal issues, finances…..and even today i am still cleaning out her stuff and trying to finish the estate. i will always be doing something b/c i have to still pay bills and things until i die….so i will be her caregiver until i die…. It is very hard when you become ‘the parent’ of your parents. It changes everything but you are also so happy they are still with you. Caregivers have one of the hardest jobs. I worked in Healthcare for the last 6 years and I know. I love what I do. My grandmother is my grandfathers caregiver and i praise her every day. I know I’d do that for my husband and him to me. I am so glad they’re still with me! I’m glad yours is with you too! My Mom has Alzheimers and before she went to line in an ALC we daughter took turns taking care of her. She needs help with her medicines, meals and her personal care. In some ways it’s like taking care of a toddler again. I think the attitude of the person being cared for makes a big difference in the over all relationship. I could never work in health care. A natural way to take care of yourself is by getting a massage! Thanks for the helpful tips. 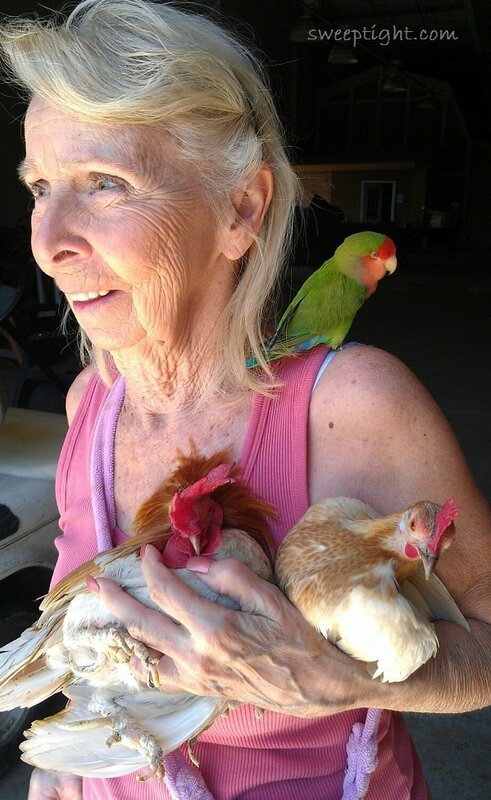 Love that picture of your grandma with the pretty birds!